Read carefully the astro remedies to get child by astro uncle. its a long post, read each and everything carefully, astro uncle shows remedies for childless couples to get child, with reason and remedies. Santan Prapti ke Astro Upay by Astro Uncle. The fifth place of birth chart shows happiness from offspring. But along with fifth, person’s first, second, ninth and eleventh place would be good then person has happiness from child. Moon, Mars, Venus and Jupiter are strong then also people have good child. If the yoga of child is strong then child would be prestigious, healthy and rich. The place of child is stronger then parents get love from their children. If first, second, fifth place, Venus and Mars are strong then male have ability to give birth to child. If the effect of Venus is good then child loves their parents. If there is Pitru dosh then there would be delay in child birth. If someone has Sundosh then also there is delay in birth of child. If there is Jupiter dosh then boy cannot birth. If there is Moon dosh and Mercury dosh then girl cannot give satisfaction to their parents. If there is adverse effect of Rahu on second place then also there is delay in birth of child. If Rahu affects on fifth place then person should try to treat their children that they cannot go against them in future. If Rahu affects on Moon then children does not stay with their parents. If Rahu affects Mercury then there is more argument with children. People whose Moon is weaker than they do not have more children. Also if Jupiter is weak then there is delay in birth of child. 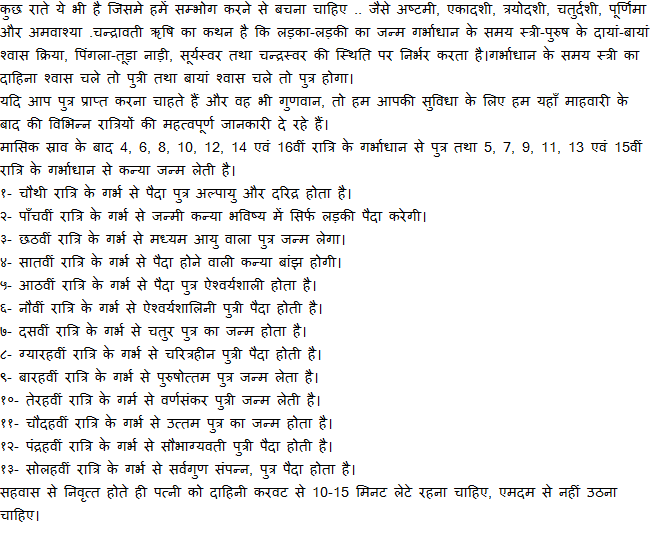 If there is effect of Rahu and Saturn on second and fifth place then child birth is not possible. If there is women run then child does not stay with them. Also if there is dosh of mother then child does not take care of their parents. Due to adverse effect of Mars and Rahu there would be delay in birth of child. Person gets complete report even if they are physically fit but they have delay in birth of child. If there is adverse effect of Mars and Venus then abortions happens in 90 days. You should do diet. You should do stomach exercise. If there is source of water is middle in the house then it creates problem in child birth. Women whose lump are big they have delay in child of birth. They should control their weight. Those women whose legs are big they also have to control their weight. However women whose lump are small they should eat such food which gives them energy and power. They should do exercise to give strength to their uterus. If thumb of left leg is big and broad and the index finger is big compared to thumb then they definitely will get happiness from child. They get late happiness from their first child, also they have some problems due to distance between their children. Also due to mood change they have lack of happiness from their child. People who have habit of smoking and have weak Jupiter then they have problem of getting happiness from their children. Also Saturn is weak then even if having child they do not get satisfaction. If there are straight lines on Jupiter Mountain and it is upward then you will definitely get happiness from your child. Women should have this place healthy. There should not be broken lines, spots and broken square. If Mountain of Venus and Mars should be upward in male. Also Mountain of Mercury should be good. There should be marriage line in your hand which gives happiness from your child. If there are lines on Mountain of Mercury then you will definitely have child. If there are such lines on marriage line then also you will have child. If you use medicine and such products then the possibility of child might be less. If lines are straight and deep then you will get happiness from your child for a long period of time. If lines are outside of hand then birth of child happens early. The small lines above the heart line show the fertility in male. Such lines which come outside of palm and from Mountain of Mars and goes to Mountain of Moon it shows the happiness from child. Lines which are on mountain of Moon shows the happiness from child. If such lines come through hear line and goes towards Mountain of Moon then they get more happiness from child. If three lines of Manibhandh are complete then child becomes healthy, charitable, prestigious and rich. Their parents can be known as their children’s fame. Such lines which comes from outside towards Mountain of Venus, it shows that there might be delay in birth of child. You should be thin, have patience and free from women run. Also you should serve the cow. If the length of leg’s finger increases from small to big then there should be birth of child. It might be delay but person definitely will have child. If women have circles in their legs then they have child. You should worship to your deity. You should give patience to your Pitrudosh. You can also do Santan Gopal Strot. You can do this in front of Ladu Gopal. You should wear more copper than less gold. Male should wear necklace of sphatik. You should do control on your weight as well as stress. You should avoid alcohol. You should do Anuloam Vilom. You can also do Kapalbhati. You should avoid yourself from cold and winter. If menstrual in untimely then you can take orange water and keep it in front of Sun for 11 days and drink it. Women should avoid gas and acidity problem. You should eat cow’s ghee. You can drink water in copper glass. You should eat light food and avoid having fat. You can also drink mild hot water. Male should eat Anjir. They can also eat pickle of white onion. They can drink elaichi and sugar milk. You can also do hariwanshpath. You can also feed dog.